Over the past decade, America’s taste for Thai food has evolved beyond the typical pad Thai and chicken satay. Now, even the most basic food enthusiasts are espousing the merits of papaya salad (even if the traditional dried shrimp are missing). New York City has followed the same path. In the not-too-distant past, there were just about a handful of destination-worthy Thai restaurants, most of which required an excursion to Queens. That’s certainly not true these days. Brooklyn and Manhattan now have excellent Thai restaurants, too, offering all kinds of regional specialties from the spicy, seafood-rich Isaan cuisine found in the northeast to the mouth-scorching Indian-spice-infused fare found down south. Eight versions of somtum (green papaya salad), the restaurant’s signature dish, are on the menu in this stylish, minimalist space. Just like its Bangkok counterpart, the East Village outpost specializes in Isaan-style cuisine from the northeastern part of the country, along the Mekong River. Plan to eat ice cream or chug a gallon of milk after leaving: many of the dishes are face-tingling spicy, the kind of heat that intensifies over time, including the eponymous specialty. The variations here are diverse and fiery, from the original papaya salad with small dried shrimp and the tum poo-plara, with funkier fermented fish sauce and field crabs, to versions topped with salted egg and grilled pork neck. Finish your meal with juicy deep-fried chicken thighs, marinated pork skewers, and larb, one of the spicy, herbaceous minced meat salads native to the region. Oh, and you’ll probably need to get an order (or two) of sticky rice to quash the heat. Supanee Kitmahawong and Phakphoom (Chris) Sirisuwat, the team behind Somtum Der, upped NYC’s regional Thai food game, yet again, with this NYU-area spot, opened in early 2015. At Kiin Thai, the menu focuses on the fare from Central and Northern Thailand, working its way from the well-balanced, often Chinese-influenced fare around Bangkok, up to Chiang Mai, where you’ll find copious amounts of herbs and spice. Examples of the latter include homemade, grilled Sai Ua sausage and Khao soi, curry-scented coconut milk filled with noodles, chicken, and aromatics, scented with homemade chili oil. 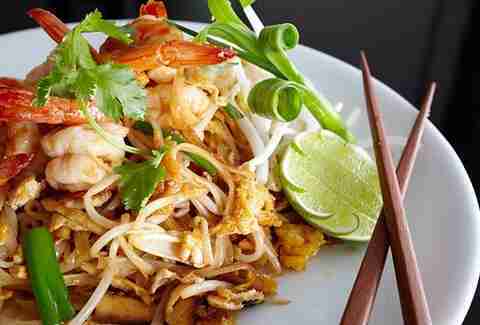 Here, Pad Thai is a dish worthy of acclaim. It’s not that saccharine mix you’ll find at joints catering to many Americans’ penchant for all things sweet. 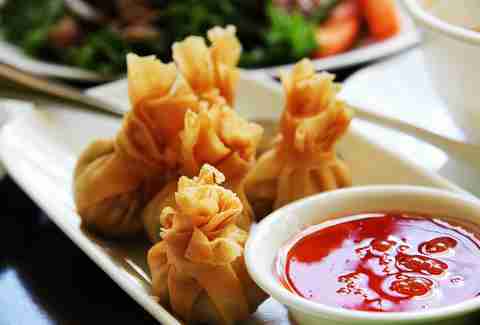 Noodles are cooked to the ideal consistency, flavored just right, wrapped inside an egg crepe with shrimp on top. As you’ll find in Thailand, sugar, crushed peanuts, dried chilies, and pickled turnips are served on the side, so diners can customize. Spice-loving New Yorkers have long been making the pilgrimage, down the 7 line to Woodside for a taste of SriPraPhai’s excellent Thai. The place offers a purview of the entire country with fantastic renditions of mainstays from every region. Friendly servers will warn you about the level of spice -- and courteously tell you returns are not accepted -- when you order the Southern-style curry. It’s a lethally hot blend of shrimp paste, turmeric, chilis, vegetables, and meat in a fragrant, translucent liquid that foregoes the heat tempering coconut milk found in other, milder curries. You’ll also find a great papaya salad, khao soi, and some great whole fish. Make sure to bring cash and plenty of it: the food is inexpensive, but chances are you’ll want to work your way through the multi page menu. Credit cards are not accepted. To be clear: Pig and Khao is not strictly Thai. Top Chef contestant Leah Cohen offers her own take on dishes from across Southeast Asia with an emphasis on Thailand and the Philippines. 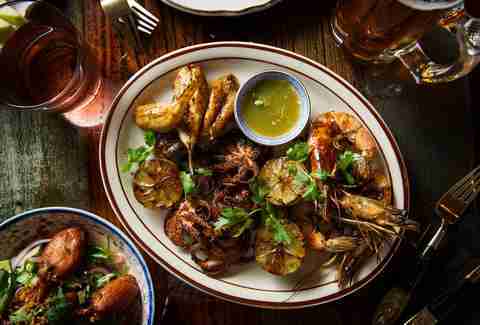 Her cool Lower East Side restaurant offers versions of regional dishes that are just badass. 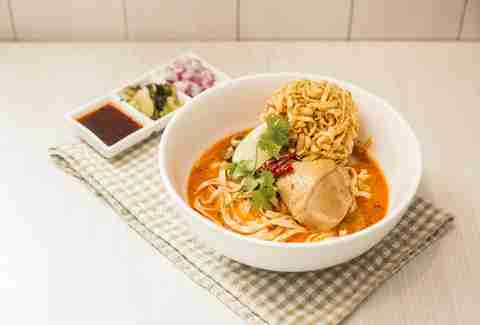 Slurp up hearty, curry-scented khao soi while Biggie or Bone Thugs blare through the speakers. 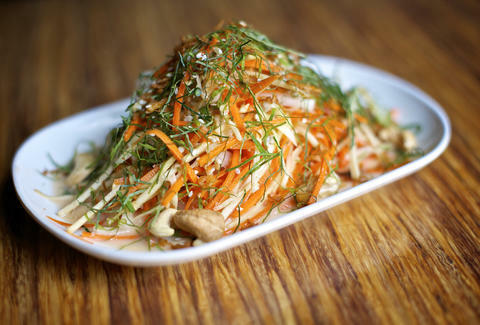 Cool down, while heating up the palate, with elevated green papaya salad. Cohen’s could almost be a meal on its own, topped with juicy, charred chicken, crispy taro, herbs, lime, and a nice dose of fish sauce. At this lively, Friday-night appropriate spot, you can wash down the spice -- or add another layer -- with unique cocktails like Bangkok Fire, a blend of rye whiskey, Thai chili-infused honey and lemon. The namesake dish of this tiny, Northern Thai spot in Red Hook is a must-try for any aficionado of bold flavors and spice. Springy egg noodles and chicken leg float in a honey-hued broth of curry and coconut milk. 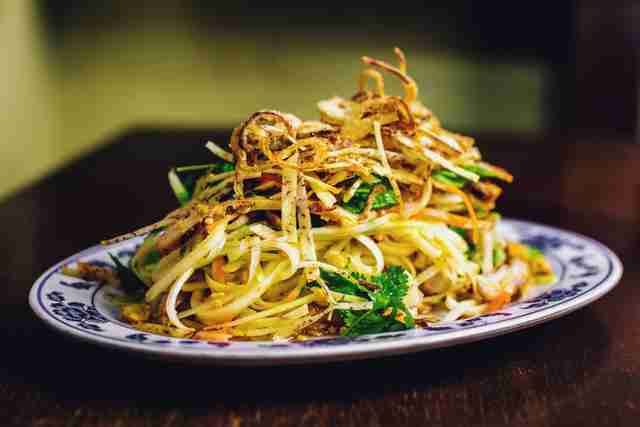 Brittle threads of fried egg noodles, scallions, and green papaya fritters sit atop, with a lime wedge teetering above the nest. You’ll want to load your pint-sized table with other regional dishes, too, like sai oua, fried banana blossom and nam prik ong, a platter meant for dipping with pork rinds, lettuce, and crudites of steamed cauliflower and long bean, surrounding spicy, briny, and slightly sweet pork mixture in a small bowl. Be prepared to wait for a taste: this Lilliputian restaurant tends to fill up. Named after the idyllic island in the Gulf of Thailand, this modern Brooklyn spot is a bit of a misnomer. The food wouldn’t fall in the category of Southern or, even, Central Thai. Chef-owner A Napadol hails from Roi Et in the Northeast, Isaan part of the country. She grew up preparing food from that region, helping her grandmother cook for the old lady’s in-home restaurant. At Napadol’s posh, date-night appropriate spot, the chef serves many of the dishes she learned from the matriarch, items that represent the home-style fare found throughout the Northeast. While sitting on curved booths underneath geometric chandeliers, sample Napadol’s updates on family recipes like chili- and herb-scented steak tartare (known as num tok koy), papaya salad, and sliced steak salad, as well as specialties from across the country. Napadol aims to make lighter dishes that aren’t coated in sauce or sugar, so CrossFit- and Paleo-obsessed crowds have plenty of options. In 2015, the Queens location of Zabb Elee was one of the few restaurants in the borough to receive a Michelin star. Both it and its younger East Village sibling were lauded for their spicy, sour, and funky Isaan-style fare. Things changed in 2016, when both were sold off. Like its predecessor, the Manhattan outpost, now named Zabb Ver, has different owners these days, but one of the former chefs has come back, bringing along a wholly uncompromising menu -- not a pad Thai in sight. Anticipate complex Northeastern dishes like salty crab papaya salad, spicy ground duck larb (meat salad), and Thai Isaan sausage, fermented with pork and rice. The Northeast is known for its complex layers and boatloads of spice, but the southern part of Thailand reaches another echelon when it comes to mouth-searing heat. One of the chefs at this chic Queens restaurant hails from the South, so it offers some unique-to-NYC specialties from the Malay peninsula. Try the gaeng tai pla, a sour and heady fish curry laced with chiles and copious vegetables. Another example is kua kling. Kind of like larb, ground meat (here, pork, beef or chicken) is coated in curry paste and herbs, served with cucumbers and lettuce, consumed by hand. Milder dishes are available, too, like Indian-influenced massaman and yellow curries. 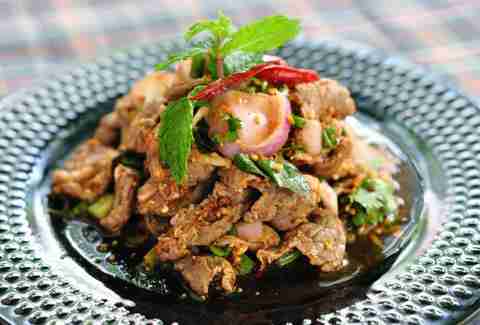 The menu offers excellent dishes from other regions, as well, like an incredibly scorching Northern-style wild boar stew called pad ped moo pha. Chef Andy Ricker calls himself a “proud copycat” of Thai cuisine. Sure, that’s kind of accurate: he’s a white dude from North Carolina who cooks food from Thailand. But Ricker has played a large part -- if not the lead -- in America’s current obsession with regional Thai. Since opening his original Northern Thai-focused Pok Pok location in Portland, Oregon, in 2005, followed by Pok Pok NY in 2012, Americans have become more willing to dig deeper into spicier, funkier, and more herbal dishes than ever before. Ricker introduced many to peppery Isaan-style papaya salad, which is hotter, fishier, saltier, and far more sour than most stateside incarnations -- or, even, Thai variations. Sai Ua, the aromatic Chiang Mai sausage, is now part of foodie vernacular. Ricker’s is grilled and served with Naam Phrik Num (a spicy green chili condiment), pork rinds, and steamed crudite. Ricker did not invent these dishes; most have been around for centuries in Thailand and in select US Thai restaurants as long as Thai chefs have lived in the States -- but his desire to explore the roots, ingredients and history has opened up a conversation of Thai cuisine that was long overdue. While Andy Ricker brought regional Thai cuisine into the national spotlight, fellow chef Ratchanee Sumpatboon is responsible for showing New Yorkers the ways of Isaan cuisine. She helmed the spice-fueled kitchen at two destination-worthy Queens restaurants, Chao Thai and Poodam, before moving into Manhattan to open Zabb Elee, then her own place Larb Ubol. All of which have received rave reviews from critics. A few years back, Sumpatboon opened two simply adorned outposts of Lan Larb, one in Kips Bay, the other in SoHo. There, you’ll find Northeastern dishes including eight larbs (word to the wise: get the duck), multiple papaya salads (one Laotian-style with raw crab and another Isaan-inspired with dried shrimp) and seafood soup, as well as a sprinkling of other specialties, like noodles and curries. Sara Ventiera is a freelance writer for Thrillist. She’s a glutton for chili-induced punishment.